Apple crumb cake (or cuca de maçã) is a traditional German coffee cake topped or filled with apples. Serve it plain for breakfast or drizzled with caramel sauce or homemade dulce de leche sauce as an afternoon treat. Oh, didn’t I tell you that we are baking Cuca de Maçã or Apfel Streuselkuchen? Huh? Well, this wonderful German creation is an apple crumb cake. Our Apple Crumb Cake or cuca de maçã, as it is known in Portuguese, was brought to Southern Brazil in the 19th century. That is because this is where the bulk of German immigration was concentrated, influencing Southern Brazil’s architecture and cuisine. this traditional coffee cake is made of a either a yeast dough or a shortening-based dough (ours), covered/filled with apples and topped with a sweet crumb topping (streusel). There are many variants of apple crumb cake or cuca de maçã in Brazil that differ both in terms of dough, and whether or not apples are incorporated as a filling or as a topping (ours). Our cuca de maçã is great when served plain for breakfast, or drizzled with caramel sauce or a homemade dulce de leche sauce as an afternoon treat. Preheat oven to 350°F (about 177° C). Grease bottom and side of a 8 x 8-inch baking pan. Set aside. First, make the streusel topping. Combine flour, sugar, and cinnamon in a small bowl; cut in butter with a fork until obtaining fine crumbs. Add heavy cream and vanilla, mixing well with a fork until crumbs form (the cream will add moisture to the streusel). Set aside at room temperature so that the vanilla will infuse the streusel with flavor. In a medium bowl, combine together the sifted flour, sugar, baking powder, and salt. Pour in and then mix both the melted shortening and butter with a fork until obtaining fine crumbs. In a separate bowl, whisk together egg, cream, and vanilla. Add to crumb mixture, tossing gently with a fork or by hand until mixture forms a ball. Press dough in an even layer into the prepared baking pan. Arrange apple slices on top of crust and then sprinkle the reserved streusel evenly over apple slices. Let cool on a rack and slice into squares. Serve apple crumb cake or cuca de maçã plain (the traditional manner). Or alternatively, warm and drizzled with dulce de leche sauce and accompanied by a scoop of ice cream if desired (my favorite way). Traditionally, no caramel or dulce de leche sauce tops cuca de maçã. But since this is a very mild-flavored cake and I have a big sweet tooth, that is the way that I serve mine. 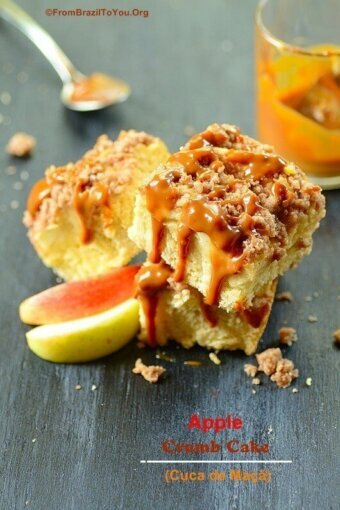 If you would like to try other apple goodies as well, I’d like to recommend to you these two fabulous treats: Caramel Apple-Brownie Cheesecake and Caramel Apple Streusel Cake. And just in case you were wondering, no, this last cake is not the same as our cuca de maçã/apple crumb cake! Now, if you will please excuse me, I have some serious eats to get busy on, accompanied by a good cup of coffee. Apple crumb cake (or cuca de maçã) is a traditional German coffee cake topped or filled with apples. It is great served plain for breakfast or drizzled with caramel sauce or homemade dulce de leche sauce as an afternoon treat. First, make the streusel topping. Combine flour, sugar, and cinnamon in a small bowl; cut in butter with a fork until obtaining fine crumbs. Add heavy cream and vanilla, mixing well with a fork until crumbs form (the cream will add moisture to the streusel). Set aside at room temperature so that the vanilla will infuse the streusel with flavor. In a medium bowl, combine together the sifted flour, sugar, baking powder, and salt. Pour in and then mix both the melted shortening and butter with a fork until obtaining fine crumbs. In a separate bowl, whisk together egg, cream, and vanilla. Add to crumb mixture, tossing gently with a fork or by hand until mixture forms a ball. Press dough in an even layer into the prepared baking pan. Arrange apple slices on top of crust and then sprinkle the reserved streusel evenly over apple slices. Bake for about 35-40 minutes or until a toothpick inserted in the center comes out clean. Let cool on a rack and slice into squares. Serve apple crumb cake or cuca de maçã plain (the traditional manner), or warm and drizzled with either caramel sauce or dulce de leche sauce and accompanied by a scoop of ice cream if desired (my favorite way). Nossa, que maravilha de bolo! Perfeito para abrir o outono! Obg, Sally! Pois é…Algo para celebrar minha estação favorita! I can’t wait for the festive season too. The colors, the weather, the festivities and of course all the wonderful dessert like yours. This looks really good Denise. Thanks, Ash!!!! Let’s celebrate the season. Oh my! This cake looks so so good! Thank you for the history lesson and sharing this recipe – I had no idea apple crumb cake orginated in Portugal. Thanks for stopping by, Shashi! This cake originated in Germany and it was brought to Brazil by German immigrants. The final swirl of caramel is just genius! What a scrumptious Apple Cake just in time to welcome fall! Please can i have it on my plate. Looks delicious. It brings the smells of fall all the way to Brazil. Wow Denise, looks very delicious, I can smell the apples being cooked in the oven…!!! Thanks, Chris! I did not know this detail about your Mom…Well, this cake was brought to Brazil by Germans and more than one century later, we still enjoy it! I can’t seem to let go summer just yet, but I get the enthusiasm for fall baking. Can’t wait to jump into the bandwagon soon! This is so delish, Denise. I love the decadent toppings!! Ohh my look at that dripping caramel, it makes that crumb cake even more delicious. We’ll be totally ready for the autumn season with delicious cakes like this! Love the crumb topping! Such a nice cake! Apples are just starting to arrive in the grocery in quantity – one of my favorite times of the year! Good stuff – thanks. Thanks, John! I am looking forward to making many apple baked goodies. Denise, this cake looks amazing! I’ve been baking a lot with apples too – love apple desserts! My mother-in-law just sent me a whole bag of apples right from her apple tree! And, I also prefer dulce de leche to caramel sauce. Pinned! Love apple desserts. And the caramel topping puts this very high on my list! I love apple crumble cake and this version looks sooo good,mmh. Thank you, Daniela! I wish I could send some to you. Enjoy your time in Austria! Thanks, Dina, and welcome to FBTY! Amazing!!! Would love this anytime! Thanks, Asmita! Good to hear from you again. Holy Cow! What a delicious cake to celebrate your favourite season! I was simply looking at this gorgeous cake for sometime…I am going to make this cake for sure as it has apples in it, which I love to add in my baking. Wonderful crumb cake recipe…I am confident that my family would love this. Thanks for sharing the recipe! Thank you, Purabi! I hope your family enjoy it. You started baking using fall ingredients. Beautiful and delicious cake. Lately I introduced your blog to my Brazilian neighbor and she said she enjoys reading your blog. I should ask her to bake this together. 😀 Looks yum! Thanks, Nami! I hope you and your Brazilian neighbor bake it together. This is an excellent coffee cake. Sonali, dear! Thank you so much for such a nice comment. I am so glad that you enjoy seeing my cake on the screen. I hope you have the chance to make it, Sowmya! Thank you, Panos and Mirella! At least here in southern Brazil this would never be considered a cake. More like a sweet bread. Imho, the dough is more similar to that of a bread than that of a cake. There are 2 types of Apfel Streuselkuchen (or cuca de maçã). The traditional, made from yeast dough, which is technically a bread. And a “modern” version, made from a shortening-based dough (my recipe), which is more a coffee cake (there is no yeast involved or a leavening process, only baking powder and uses the same process as for a cake). One cannot blame people for looking at both versions and think they are cake because they look like a ‘flat cake’ although one of the versions is technically a bread. Even the original designation fails to categorize the original yeast dough-based apfel streuselkutchen as a bread because they called it kuchen (which it means cake in German). In Brazil, as in Germany and the rest of the world, there are 2 types of apfel streuselkutchen or cuca de maçã and mine is definitely the “modern” version. I don’t know whether you did read my article but I do explain the difference between the 2 versions and tell which type mine is.